Plus: How to make your own vector & bitmap textures. 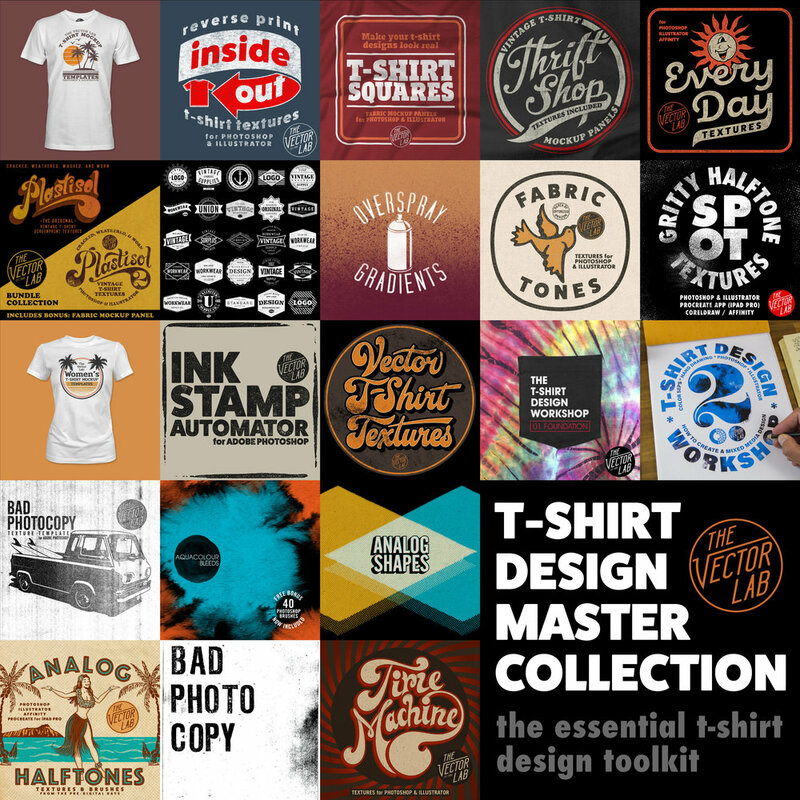 Here is a visual reference of all the resources included in T-Shirt Design Master Collection. At only $79, it is by far the most complete collection of textures, workshops, tutorials, textures, and templates ever offered on TheVectorLab. 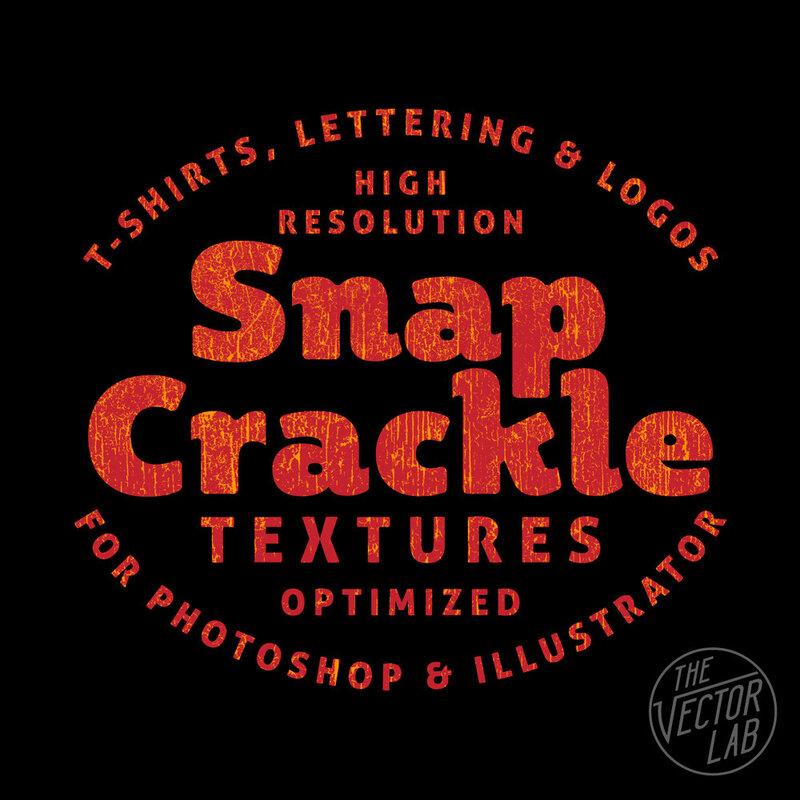 Make your t-shirt designs look vintage with “Plastisol 2” cracked ink textures. Plastisol 2 textures have SUBTLE EDGES, giving designers precise control of where to place the textures onto graphics. 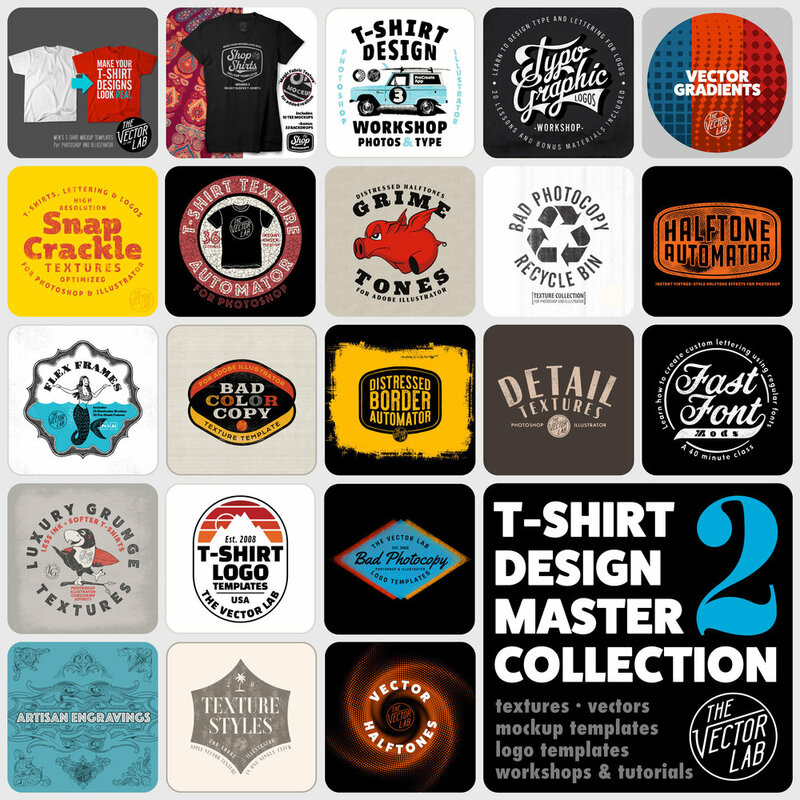 These 30 SUBTLE EDGE textures were created from 600 DPI scans of real vintage t-shirt graphics. The smallest texture is 625 x 406 pixels and the largest texture is 3357 x 3374 pixels. Also included is the Free Bonus Fabric Mockup Panel + instructions mentioned in the video above. Print a t-shirt. Repeatedly wash & wear the shirt for 10 years. 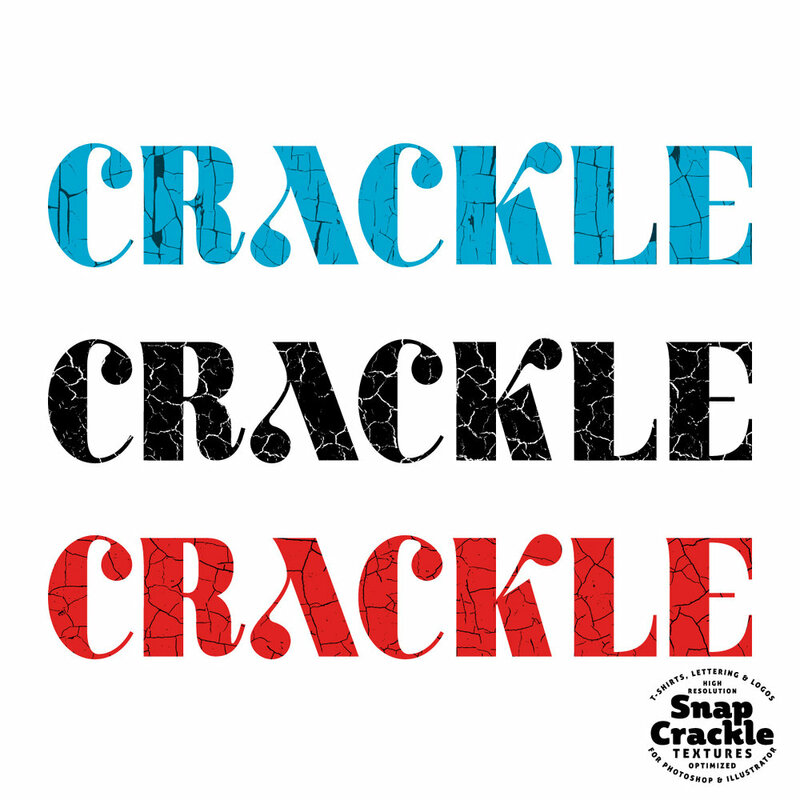 Use a crackle ink to print your design. It's good to give it a wash before selling so that the cracks will become more visible. Use the "Plastisol" collection of Photoshop Brushes and Bitmap Textures to add a consistent & reliable vintage look to your designs. You might enjoy the Plastisol Textures Collection because 10 years is a long time to wait for t-shirt ink. How do graphic designers get a vintage cracked ink look for their t-shirt designs? It starts with Plastisol Ink. I've wandered through thrift shops, vintage clothing stores, and flea markets to gather only the best t-shirt specimens. These t-shirts with aged, worn, and washed cracked ink were then scanned into the computer. The scanned images have been turned into a collection of textures (bitmaps, JPEGs and Photoshop Brushes) that you can use to make your own t-shirt designs look vintage. This collection of textures has been named "Plastisol"
This collection has 10 different 'base' textures, each with a Light, Medium, and Dark version. The "Dark" textures are the most beat-up, vintage, and abused. The "Light" textures have less weathering or "distress." (Please note, there are no vector files in this collection. Use the Bitmap Tiffs in Illustrator for much more detailed texture that won't bog your computer down). My favorite versions are the BITMAP TIFF files and the PHOTOSHOP BRUSHES! BITMAP TIFF: The white areas in these textures will be transparent when you place them into your Illustrator files (yes Illustrator!) on top of your vector graphics. Color these the same as your background, so it looks like the background is coming through your graphic. This method of adding texture is an old-school trick used by all the veteran t-shirt designers out there. PHOTOSHOP BRUSH: What can I say... these are super easy to use. Just double-click on the .abr file and these brushes will load into your Photoshop Brushes Palette. Select a brush, and click to paint in your vintage texture! If you are printing t-shirts Direct to Garment (DTG) with an online service like Spreadshirt, TeeSpring, or UberPrints here are some things to know when preparing your art files. Unless your design is a solid rectangle of ink defined by the dimensions of your image file, it will best be prepared with a transparent background. An art file with transparency will also be required if your design has a distress texture (like Plastisol, Time Machine Textures, or Bitmap Textures) that knocks back to shirt fabric color. Otherwise, you may get back a t-shirt with printed ink texture. Many of these companies accept only a few limited file types. The most universal solution is to send them a PNG file with a transparent background (and transparent texture). A transparent PNG can easily be exported out of Photoshop or Illustrator. If you have a flattened one color image, here’s one way you can remove a white background color. 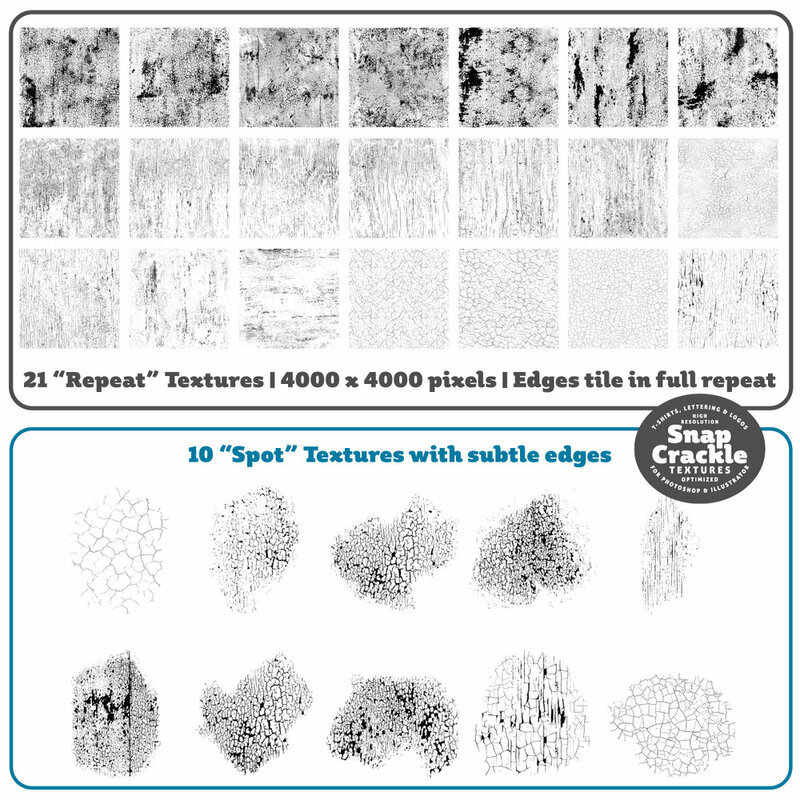 To knock distress texture through your design, the simplest method would be to erase the texture out of your design if you have any Photoshop Brush textures like the ones mentioned above. Just double click the brush files to load them into Photoshop. Select your eraser tool. Select one of the texture brushes from the brush panel. Size your brush using the [ ] bracket keys, and click to erase out the texture. Save your file as a PNG. If your Photoshop file is layered, you can group all the layers that you want textured. Highlight that layer group in your layers panel and go to Layer >> Layer Mask >> Reveal All. With that layer mask highlighted in your layers panel, simply paint in black with one of the texture brushes to knock texture through your design. This method is good because using the layer mask makes it nondestructive to your art. Just hide the background layer (if there is one) and save a copy of your file as a PNG and upload it to your t-shirt print vendor. If you have a background-less design in Illustrator, you will have no problem sending a vector file to be printed. However, if your design includes bitmap or vector textures that go back to t-shirt fabric color, then you will want to use this Opacity Mask method. Export your art as a PNG anywhere between 150-300 DPI at the printed dimensions that you want. Your exported image will no longer be a vector file, but that's completely fine. When you go File > Export, have the transparency box clicked so your textures become transparent to the background color. When you upload your files, make sure to add your desired dimensions in the notes. Even if, for example, your PNG file is saved as 11" x 6" @ 300 DPI, it doesn't mean the person printing your image will know to print it 11" x 6" on the shirt. I've have found that unless you specify, your t-shirt design will often come back bigger or smaller than you wanted. While you are at it, you might as well specify the placement of your graphic on the shirt. For instance, you could include a note that says "Please place graphic 3.75" beneath collar seam." Today I am announcing two new items. The first is a brand new collection of 15 halftone texture brushes for Adobe Photoshop. It's called Gritty Halftone Spot Brushes. They fade out with no hard edges, making them perfect for adding subtle gritty texture to your type, logos, and illustrations. Go here to see Gritty Halftone Spot Brushes. Even better, at the bottom of this post I will tell you how you can get Gritty Halftone Spot Brushes as a Free Bonus. The second new item that I have for you today is a bundle of some of the best textures available on TheVectorLab. Order Time Machine & Bitmap Textures Bundle today, and get the brand new Gritty Halftone Spot Brushes for Photoshop as a Free Bonus!